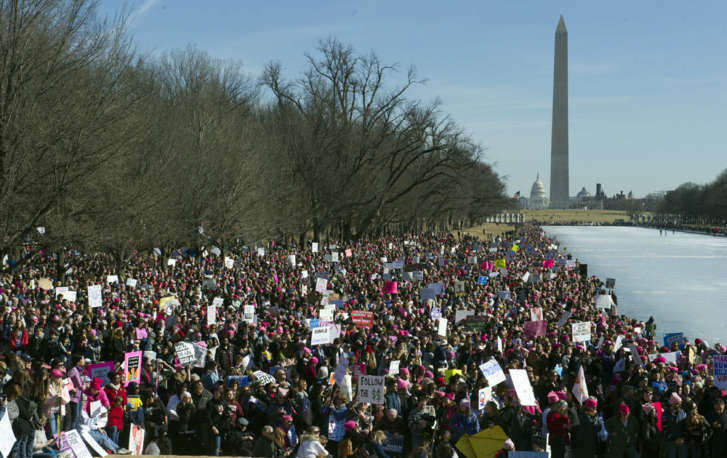 Almost a year after the historic 2017 Women's March, marchers carried signs and donned pink hats in D.C. once again. See photos and video of Saturday's march. WASHINGTON — Almost a year after the historic 2017 Women’s March, activists gathered in D.C. — and across the U.S. — to march once again. The 2018 Women’s March in D.C. began at 11 a.m. Saturday with a rally at Lincoln Memorial and a march from the National Mall to Lafayette Park and the White House. 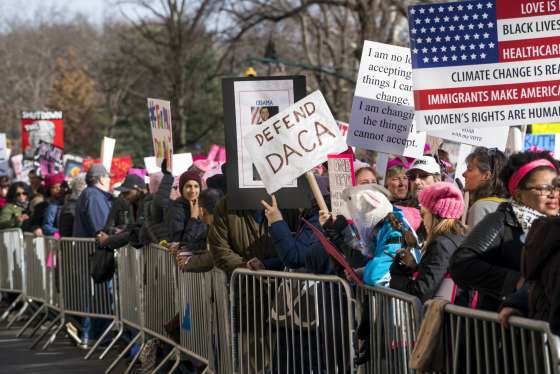 Marchers carried signs and donned pink hats made iconic by the 2017 Women’s March on Washington as they rallied to commemorate the anniversary of the first march, which brought millions across the country onto the streets a day after President Donald Trump’s inauguration. The theme for this year’s march, Power to the Polls, is intended to empower women to vote and to run for office. One of the speakers at the rally, Va. Del. Kelly Fowler, is an example of that theme at work. “Last year I marched, then I ran — then I won,” Fowler said, prompting massive cheers from the crowd. The message stressing the importance of women’s involvement in government resonated with many women at Saturday’s march. Marcher Becky Gulden says the march was especially important with the government shutdown. Katie Keller attended the 2017 march and brought her kids to Saturday’s march. She also agreed with the 2018 march’s call to action. “We have to vote. If we want to make changes, we must get involved,” Keller told WTOP. D.C.-based a cappella group, SongRise, performed on the Mall during the march. The collective is made up of local singers who say they want women’s voices to be heard, and singer Adejoke Ashaye says the group’s voices will continue to be heard in protest and in song. “I think it’s important for the world, for the administration, for everyone to see that we’re united,” Ashaye said. While some marchers wanted to empower women and advocate for a range of issues, others came to protest the president exactly one year after his inauguration. Almost a year after the historic Women’s March on Washington, activists are marching once again. See photos of the Women’s March across the U.S. Many of this year’s marchers came back after attending the 2017 march, which drew large crowds the day after President Trump’s inauguration. Destiny Herndon-De La Rosa and Cessilye Smith, founders of a group called New Wave Feminists, attended both marches. “This year, it’s just been a wonderful opportunity to come represent all women and a different voice to the women’s movement,” Smith said. Pam Murray, of North Carolina, attended this year’s march again with her daughter, Kendra Chittenden, of Springfield, Virginia. “I wanted to be here again to mark the first anniversary and to say, ‘We’re still here,'” Murray said. While the issues people are protesting this year may be similar to last year’s, Murray says the 2017 march made a difference in her behavior. “I’ve written more letters to my congressmen and I’ve gotten a lot more involved,” Murray said. Last year’s march inspired some women to run for office and to communicate with their elected officials, but some who attended Saturday’s march are disappointed with the rate at which change is happening. Nina Butler, of Ashburn, Virginia, was at the march because she says what’s happening in the U.S. is not OK for women. “Politically, I don’t think we’re getting anywhere, I don’t think the legislation is changing, I don’t think women are getting what they need,” Butler told WTOP. The march is one of many similar events scheduled across the country this weekend to mark the anniversary of Trump’s inauguration and the massive marches that followed the next day. The theme of this year’s march is Power to the Polls, and it intends to get more women registered to vote and to run for public office. The goal is to channel the energy and activism of the marches into political victories in 2018, according to the Power to the Polls website. The main event is happening in Las Vegas on Sunday to commemorate the official anniversary of the Women’s March on Washington and to kick off a yearlong campaign led by the Women’s March to get more women involved in government. The Women’s March is a women-led movement that advocates for a range of issues, including ending violence against women, LGBT+ rights, immigrant rights and environmental justice. Last year’s marches drew millions across the country, while more than 500,000 marched in D.C.
WTOP’s John Domen, Kate Ryan, Kathy Stewart, Max Smith and Amanda Iacone contributed to this report.